Yesterday was for linking to a great aria from Bach's Matthew Passion for Good Friday, and today, we've got this. Because this is one of the most amazing arias in the history of Western music sung by a truly amazing bass. And if you've followed Wenatchee The Hatchet for a while you pretty much know what's coming for Holy Saturday. Mark Driscoll’s “admin” sent out an email today with news of a revamped website and a new “application-pending registered 501(c)3 non-profit organization” — Mark Driscoll Ministries. Mark Driscoll Ministries has the same address as Living for Learning, the other “application-pending registered 501(c)3 non-profit organization” described on the former version of his website. The new Mark Driscoll Ministries has the same address as Living for Learning - 23632 HWY 99, Suite F 517 Edmonds, WA 98026, which is a UPS store. Possibly Driscoll changed the name because Living for Learning was trademarked. Something that would be hard to ignore about the name change is something that Mark Driscoll said about nine years ago, about how certain Christians get elevated like rock stars and that's not good. As is known, in the months following Mark Driscoll's leave of absence things declined within Mars Hill and the church formally dissolved at the end of 2014. The individual campuses may yet be able to successfully re-launch as autonomous churches but the current process of dissolution involves distributing and selling assets. A number of the campuses may be financially self-sufficient enough to keep going if the logistical arrangements can be made to ensure they have stable meeting venues. Meanwhile, it would appear that Mark Driscoll is positioned to have some kind of return to public ministry, although it would seem advisable to consider simple membership in a spiritual community for three to five years submitting to the kind of spiritual authority he used to admonish people to submit to when he preached from the pulpit at Mars Hill. There's still time to take that option. After all, God doesn't need any mere mortal for His will to be accomplished. Justin Dean, "What I Did Was Wrong-I Am Sorry"
Because there has been much speculation about this online, and people I love have been hurt because of my actions, I wanted to provide some further clarity regarding my earlier blog post about the list of church leaders. I want to be clear that what I did was wrong, and that I did not work in concert with or in cooperation with anyone else, including current or past employees of Mars Hill or Pastor Mark Driscoll. I operated on my own accord, without their knowledge, and without their authority. I exercised terrible judgment and I regret my decisions. I am hoping that by posting this the speculation around them will stop. I neglected to think how my actions would affect the outstanding men and women who stayed behind at Mars Hill, some of them volunteers, who manage and protect the remaining assets as they wind down the organization. Nor did I realize how my actions would harm their families or their reputation. This was certainly not my intention, and I am deeply sorry for the trouble I have caused them. A few things to consider here. If Mars Hill Church was dissolved at the end of 2014 then the corporation as it is now consists of just executive level leadership? But there aren't any executive pastors in place now, are there? Kerry Dodd's lately listed as the president and Caleb Walters may or may not still be secretary. Michael Van Skaik, Larry Osborne, Jon Phelps and Matt Rogers may still be on the Board of Advisors and Accountability but we can't be completely sure what its make-up is at the moment. Paul Tripp's resignation from the BoAA last year eventually produced a statement in which Tripp explained that he believed the BoAA was incapable of functioning in the purpose for which it was designed. So Dean has apologized for something, although precisely what he apologized for could be clarified. Craig Gross' understanding was that Dean sold him a list, while Dean has indicated being party to a transaction by promoting it but not actually having sold the list. If that's the case then what is the company that set up churchleaderslist.com? Why was the url based in New Zealand, per Craig Gross' report? The list you purchase will be delivered in .CSV file format, which you can open using Microsoft Excel, Apple Numbers or many text editors. This format is compatible with every email marketing platform such as Mailchimp, Aweber, Constant Contact, Vertical Response, and others. Simply import the list into your email system and you’ll be able to setup an email campaign within minutes. You are responsible for sending emails in accordance with CAN-SPAM laws, such as including an unsubscribe link in every email. We recommend using an email marketing platform such as any of the ones listed above. Our favorite is Mailchimp, which allows you to send up to 2000 emails a month for free. How did people join this list? Everyone on this list opted in through one or more church or Christian leadership websites managed by our partners and affiliates. How many times can I use the list? How up to date is this list? This is one of the most up-to-date lists of Christians and Church Leaders. We purge bounced emails and update the list often as people change jobs and churches. And yet by Craig Gross' account he did get a refund from somebody. The site looks like it stated that once you've purchased the list you could use the list as many times as you'd like. So if it turns out it's illegal to use the list in any capacity moving forward ... why did the entity that set up the website go so far as to say that once bought the list could be recycled endlessly? I was involved in distributing a list of church leaders to a couple of people who I assumed would only use it to spread the gospel and bible teaching. Then it would seem he would know to whom he distributed a list of names to that couple of people who may have put the list up for sale yet were not authorized to do so. The simplest and most compelling thing Dean could do at this point is explain who he distributed the list to if he wasn't the person who sold the list himself. Would the current Mars Hill Board of Advisors and Accountability weigh in on this issue? After all, the by-laws would indicate that part of their powers and responsibilities include distribution and sale of assets held by Mars Hill not in the ordinary line of business. This would seem like precisely the kind of scenario in which the BoAA should be most involved and vocal. But who exactly is even on the BoAA at this point? So if Justin Dean did not work in ccoperation with anyone else then did he even distribute a list to other parties who then put the list up for sale? Because if he didn't even do that then he's the only one who could have been in a position to sell a list. He still hasn't explained exactly what it was he did and which parties other than himself were involved, per his statement from last week. He's sorry and that's commendable to say if we'd have a significantly clearer idea what he did that he's sorry for with respect to the list. But here's the thing, based on how the bylaws of Mars Hill read with respect to the powers of the BoAA Justin Dean shouldn't even have had any access to the list as an asset of Mars Hill to begin with, right? He's not employed by Mars Hill any more, is he? And if he was in possession of assets the only entity with the authority to even entrust material to him would be the BoAA. Can the BoAA at least clarify that they did or did not, in fact, give Justin Dean any assets to begin with? If Dean's taking full responsibility for something he's done, okay, but it still seems like something he couldn't even have done if he was not entrusted with something by people at Mars Hill. And the thing is, based on the by-laws of Mars Hill the only people who legally count as members would be elders. But the corporation's dissolved/dissolving so who would the current MH elders be then? Well, Dean has a chance to clarify what happened. And if he could get around to fielding the question of what conversation he asserted The Stranger fabricated in their publishing that would be helpful, too. And maybe he could even field why he thought it was appropriate to mention some kind of tax lien thing connected to Rob Smith as if it were relevant to anything at all. Dean doesn't seem to have realized that by telling Rob Smith he hadn't managed to form a suit for more than a year that this could retroactively cast doubt on the veracity of "we're not entirely sure who they are". and there's still this from last week. If selling the list was not authorized then it was illegal, wasn't it? That would make it all the more important to establish who really sold that list. 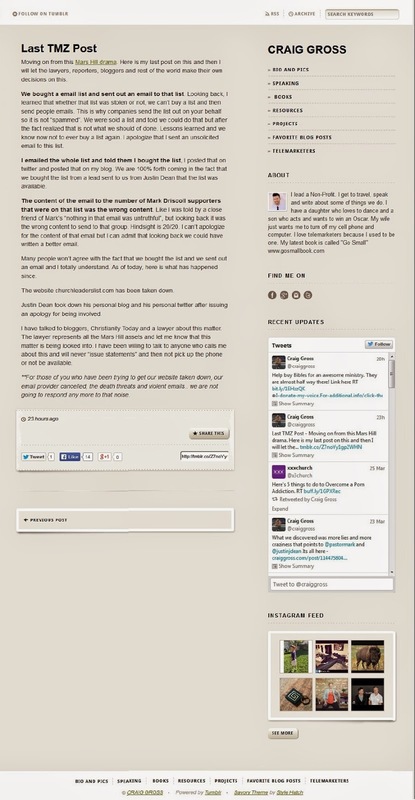 Justin Dean's indicated last week he distributed a list to a couple of people. Well, that's a short list. Who? If it turns out he didn't distribute a list to a couple of people and acted alone, as seems indicated by the new apology, then this vitiates the truthfulness of last week's statement a bit. The matter isn't about speculation but that some very, very basic questions have still not gotten unequivocal answers. Who sold the list by way of Church Leaders List? Why was the company url based in New Zealand, per Craig Gross's account. If Justin Dean distributed a list to a couple of people who were they? If he acted alone that doesn't mean he didn't distribute the list to others, after all. That Dean is sorry is certainly a thing for him to share. But the sale and promotion of the list was also done through the Ministry Communicators Association, which is more than just the individual Justin Dean. And over at I4J's comment/discussion thread, looks like Justin Dean has apologized to Rob Smith for having brought up the tax lien stuff, too. Rob, you make some great points. I owe you an apology. I could have asked you privately about the tax lien but chose to post it and use it against you. That was wrong and I'm sorry. Please forgive me. I'm sure there's more to the story and that is your story to tell or not tell. We disagree on many things but I'd rather not get involved than attack you back online. If there's ever an issue going forward I'll bring it to you first next time, and appreciate if you'd do the same. Again, I'm sorry. it may have been sparing on the details of precisely what happened but this apology from Dean was more unequivocal in its way than just about anything said by anyone in the history of MH leadership in social and mass media. And the apology to Smith was unequivocal. So that's commendable. If Justin Dean had time for the following stuff at I4J ... can he clarify which conversation he believes The Stranger staff made up? Dropping his website into maintenance mode and ending the Twitter account doesn't take this stuff away, does it? Why can't he be bothered to answer a straightforward question about which conversation he believes The Stranger staff made up in their published materials on Mars Hill? He's had a couple of weeks to clear things up. No doubt The Stranger staff recognize they offend and inspire disagreement plenty, but the allegation that The Stranger published a conversation attributed to Justin Dean or anyone at Mars Hill that Dean said was "made up" is a pretty substantial assertion. "... I would respond to bloggers and journalists all the time, trying our best to be open and communicate well. There were periods of time when we'd not respond at all. That was frustrating at times but we were doing our best to try and wade through the storm. The Stranger was just brutal and mean and would twist what I would say so we eventually just ignored them because they were hateful no matter what. They even posted a whole conversation with me once that was completely made up. It never happened. They aren't to be trusted. [emphasis added]"
If Dean asserts this can he establish which article it was, what date it was published, who wrote the article, and what it was about? If Justin Dean's got time to make comments about something that may never even happen he should surely have time to clarify to either Wenatchee The Hatchet or, better yet, The Stranger which conversation he believes was made up. It would seem that a journalistic lapse as egregious as making up a conversation would be something Dean could have answered within the last ten days. After all, if Sutton Turner found the time to come by and clear up some misunderstandings (much appreciated, by the way) then perhaps Justin Dean can follow the same example? It looks weirdly hardball for Justin Dean in terms of PR. Wouldn't the time to have played hardball PR been some time before the formal dissolution of the corporation was announced? To date there's been no statement from Justin Dean about how and why Mark Driscoll could go from sharing how in 2006 he approached co-founding elders Mike Gunn and Lief Moi to plant Mars Hill with him because they were good dads and yet in 2013 was saying from the pulpit that the reason there was no childrens' ministry at the start of Mars Hill was there were no kids. But if that was true what was with the history of attempts to contact bloggers privately on the part of MH pastors from time to time from 2007 to 2013? Clearly Joyful Exiles was not the work of people who opted to stay anonymous and it had been up for a year or two by the summer of 2014.
then there's this overview of the history of MH pastors contacting bloggers privately. Driscoll said "we're not entirely sure who they are" last year but it's hard to stand by that explanation now that Justin Dean's insisted on bringing up tax liens against Rob Smith. Note Justin Dean's comment "and you haven't produced a lawsuit in over a year." Subtract at least 13 months from March 9, 2015 and we get ... what, February 2014? Let's track back to the July 2014 statement from Driscoll. So if Justin Dean knew that Rob Smith was saying or doing anything toward the end of litigation more than a year ago then doesn't this destroy any plausible deniability about the upper echelon leaders of Mars Hill being "not entirely sure who they are" as bloggers or critics of the leadership go? Did Justin Dean stop and actually think about that implication in what he wrote before he posted? It doesn't quite seem like he did. If this is a misunderstanding of what Dean meant then, well, Dean's welcome to clarify things. It has been noted here and there that the content of Craig Gross' "Last TMZ Post" has changed within the last seven days. Without discussing that content, presented are a before and after set of screen captures. Moving on from this Mars Hill drama. Here is my last post on this and then I will let the lawyers, reporters, bloggers and rest of the world make their own decisions on this. We bought a email list and sent out an email to that list. Looking back, I learned that whether that list was stolen or not, we can’t buy a list and then send people emails. This is why companies send the list out on your behalf so it is not “spammed”. We were sold a list and told we could do that but after the fact realized that is not what we should of done. Lessons learned and we know now not to ever buy a list again. I apologize that I sent an unsolicited email to this list. I emailed the whole list and told them I bought the list, I posted that on twitter and posted that on my blog. We are 100% forth coming in the fact that we bought the list from a lead sent to us from Justin Dean that the list was available. The content of the email to the number of Mark Driscoll supporters that were on that list was the wrong content. Like I was told by a close friend of Mark’s “nothing in that email was untruthful”, but looking back it was the wrong content to send to that group. Hindsight is 20/20. I can’t apologize for the content of that email but I can admit that looking back we could have written a better email. Many people won’t agree with the fact that we bought the list and we sent out an email and I totally understand. As of today, here is what has happened since. 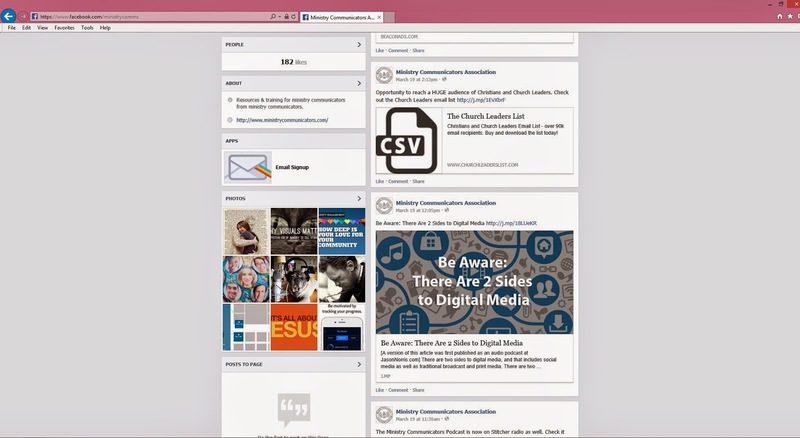 The website churchleaderslist.com has been taken down. 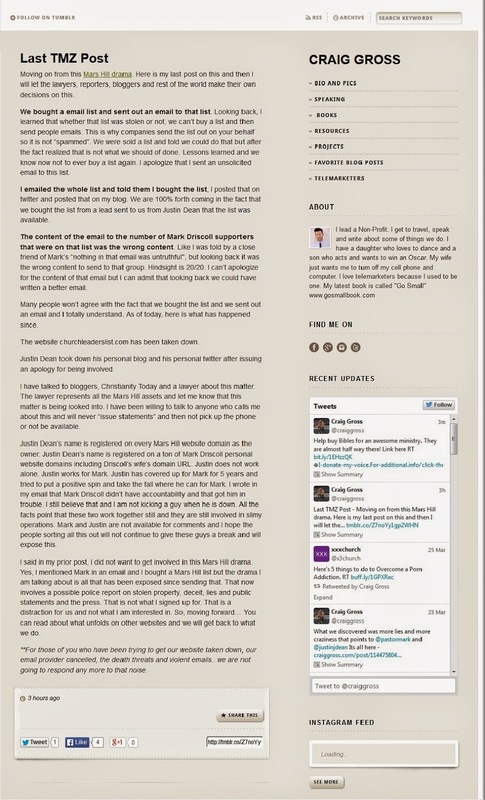 Justin Dean took down his personal blog and his personal twitter after issuing an apology for being involved. I have talked to bloggers, Christianity Today and a lawyer about this matter. The lawyer represents all the Mars Hill assets and let me know that this matter is being looked into. I have been willing to talk to anyone who calls me about this and will never “issue statements” and then not pick up the phone or not be available. Justin Dean’s name is registered on every Mars Hill website domain as the owner. Justin Dean’s name is registered on a ton of Mark Driscoll personal website domains including Driscoll’s wife’s domain URL. Justin does not work alone. Justin works for Mark. Justin has covered up for Mark for 5 years and tried to put a positive spin and take the fall where he can for Mark. I wrote in my email that Mark Driscoll didn’t have accountability and that got him in trouble. I still believe that and I am not kicking a guy when he is down. All the facts point that these two work together still and they are still involved in slimy operations. Mark and Justin are not available for comments and I hope the people sorting all this out will not continue to give these guys a break and will expose this. I said in my prior post, I did not want to get involved in this Mars Hill drama. Yes, I mentioned Mark in an email and I bought a Mars Hill list but the drama I am talking about is all that has been exposed since sending that. That now involves a possible police report on stolen property, deceit, lies and public statements and the press. That is not what I signed up for. That is a distraction for us and not what I am interested in. So, moving forward… You can read about what unfolds on other websites and we will get back to what we do. **For those of you who have been trying to get our website taken down, our email provider cancelled, the death threats and violent emails.. we are not going to respond any more to that noise. Whoever, was selling it created a twitter, a coupon code for the site and we were not the only ones to find out about this. The website is gone now but you can see the old site on a google archive here. That's not the only thing that changed in Craig Gross' posts from last week. a short update on John Catanzaro--"not currently practicing but is on site as a nutritional counselor and patient advocate"
Last year readers may recall that naturopath John Catanzaro, who was at one time Mark Driscoll's naturopath, had his license suspended. a press release late last year clarified that he would have his license suspended until at least the end of January 2015. He's to be on probation for eight years when his license is reinstated. Catanzaro reached a settlement over the suspension. ... First I went to a conventional doctor, who told me I needed blood pressure meds, heartburn medicine, sleep medicine, anxiety medicine. I'm like, Man, I'm in my 30s. That's a lot of medicine! So I went and found a naturopathic doctor, who said, "You need to quit your job and find a different vocation." I said, "Well, Jesus said to do this, so that's not really an option." So I found another naturopathic doctor. He gave me supplements, vitamins, minerals, IV treatments for adrenal support, and custom tailored vitamins. He put me on a regimen for wellness and recovery. His approach was to naturally rebuild the body, to not just treat the symptoms. He told me, "You've got to work really hard to change your lifestyle and your organization, everything." As previously noted, the irony was that while by Mark Driscoll's account he didn't want to be taking a ton of pills, when in the 2008 spiritual warfare session he described his routines he mentioned taking something like 25 vitamin supplements a day. But not everyone seems to be on board with the idea that dozens of vitamin and mineral supplements taken daily necessarily helps. At the moment Driscoll isn't confirmed as a pastor of or a member in a church, and has not been in the media much since he resigned from being preaching pastor at Mars Hill late last year. And a year later, it looks like Mark Driscoll's former naturopath is not yet back into formally licensed medical practice. 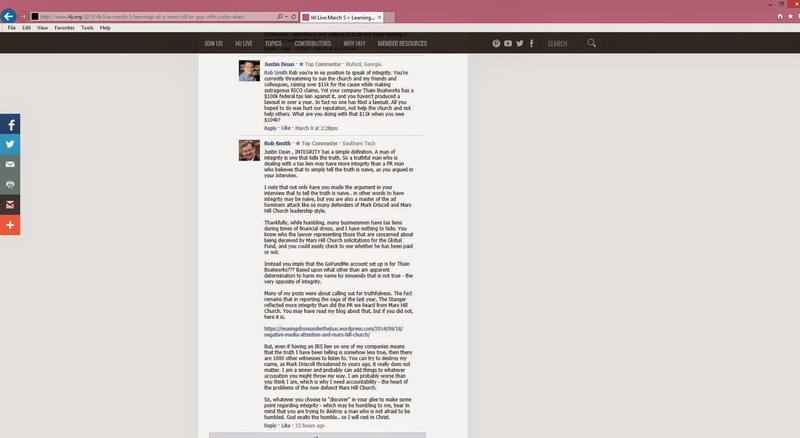 While the article from January 2014 was titled "The Survivor" this year, for the moment, neither Mark Driscoll nor John Catanzaro are currently in their respectively documented careers for now. This doesn't mean we may not see either or both of them return to preaching and naturopathy within the calendar year. That remains to be seen.